The downtown Paterson shopping district became the home of a new PriceRite at the Center City Mall over the weekend. The supermarket which brought 88 new jobs to Paterson features 34,000-square-foot of fresh fruits, vegetables, meat, seafood, and dairy products. It also contains an organic section. 80 of the 88 jobs are filled by Paterson residents. More jobs are expected to be created at the store at 301 Main Street. The store officially opened on Saturday ahead of Thanksgiving with a ribbon cutting ceremony. Officials from Inserra Supermarkets which is operating the PriceRite of Paterson celebrated the opening by donating $2,500 to the Food Bank of New Jersey. PriceRite is owned by Wakefern Food Corporation which is the cooperative behind ShopRite. 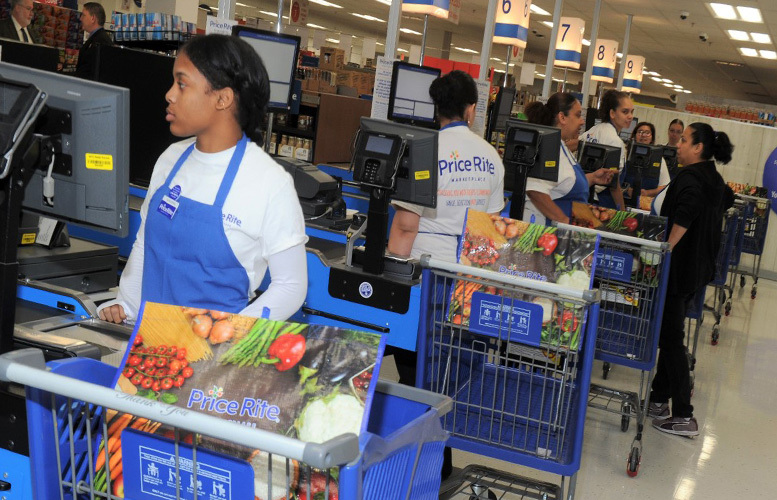 PriceRite caters to frugal consumers with lower prices than ShopRite. PriceRite is also known for having a larger fresh food selection. Opening of the new supermarket is part of the $100 million redevelopment of downtown Paterson led by Alma Realty over the past decade. The mall supports 400 onsite jobs and continues to add new retail and office businesses. Valiotis’s company is eyeing a massive expansion of the mall by opening a soccer arena that will cost an estimated $130 million. The expansion also calls for art galleries, microbreweries, medical spas, offices, retail shops, hotel, medical marijuana treatment center, and hydroponic farming. “This is such an incredible sign of progress for the redevelopment of Paterson’s Downtown,” Valiotis said of the opening of the new PriceRite. PriceRite is open seven days a week. Of all the stupid places to put a high volume supermarket, right in the middle of the most congested part of the city. The people on the town council who voted in favor of allowing this to be put there, should have their brains examined to see if they are still functioning. there are so many fruit and veggie markets downtown already. Ever hear of the Washington St pavilion? Sunny Produce Market on Market st? This is a supermarket, not a fruit and veggie market. It has everything from ice cream, fresh chicken and fish to shampoo, cat litter, soda and canned tomatoes. Ever hear of ShopRite? Well this is a discount version of ShopRite. I am sure people will continue to shop at the Super Supermarket or the Bravo, but this store will be extremely price-competitive, and I think that will be to the benefit of shoppers. Plus, PriceRite employees are union members and have full health benefits. I wonder if the other 2 markets can say the same? Ever since Food Basics closed, I think all the markets in Paterson have been non-union. Some folks just complain. They wake up and complain. Sleep and dream about the complaints they want to make tomorrow. Marking their calendars about all the upcoming complaints they want to make. My goodness. These two below have such small vision, its no wonder Paterson struggles. Totally agree with you. There will always be haters who want to be negative about everything. But then again, I think those trolls want to see Paterson continue to struggle. This is a really smart place to put a big grocery store and will benefit not only shoppers, who have a centrally-located supermarket, but it will also benefit the workers, many of whom are residents. Those PriceRite jobs are union jobs, so they come with benefits and guaranteed increases. Lmaooo best comment ever. You're so right though.